Product code: ES3383 Categories: Sold Items, Sold Jewellery. Cartier is one of the worlds most regarded jewellery and watch company and we are so proud to be able to offer an original Cartier brooch dating from the 1950’s. 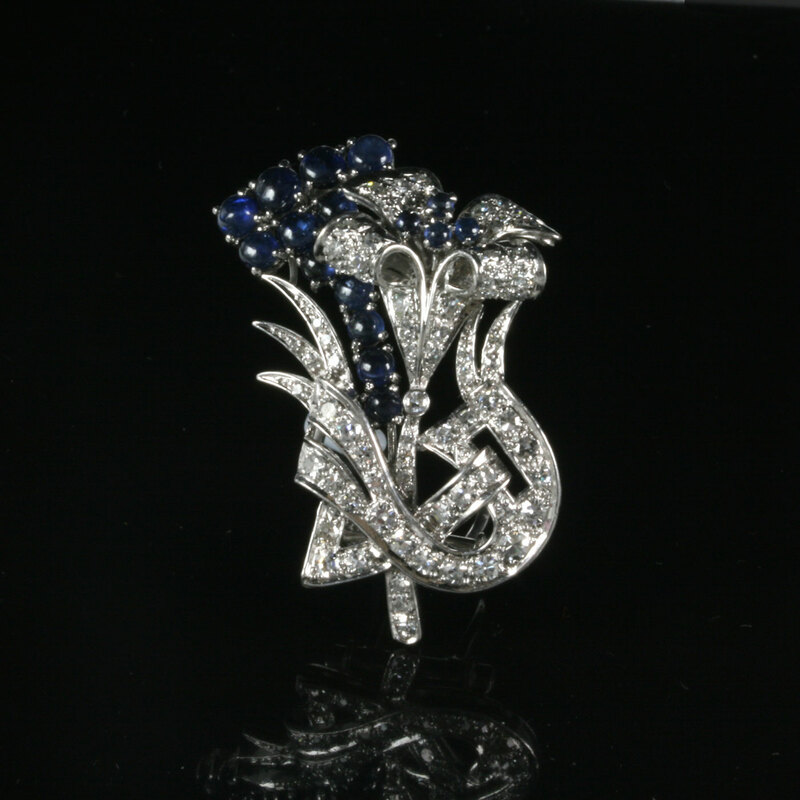 Cartier was founded in Paris in 1847 by Louis-François Cartier and has become a name that is synonymous with quality and craftsmanship, and when you look at the attention to detail in this Cartier brooch, it is so easily seen with not only the style and design but fine quality of both the sapphire and diamonds and the quality of the setting. Retro jewellery of this period of the 1940’s and 1950’s is so uniquely characterised by such a distinct somewhat flamboyant style and here in this Cartier brooch you can see that the brooch was designed not simply with a floral design in mind typical of the Victorian era of the 1800’s, rather it goes so much further with the angular asymmetrical design at the bottom. Hand made in 18ct white gold and platinum, the brooch measures 40mm by 29.4mm and will stand out on any outfit and always be admired and appreciated for its fine quality and design that Cartier is so famous for. Set with a total of 72 diamonds, the diamonds total 1.44 carats and combined with the 17 sapphires looks amazing and adds so much sparkle. 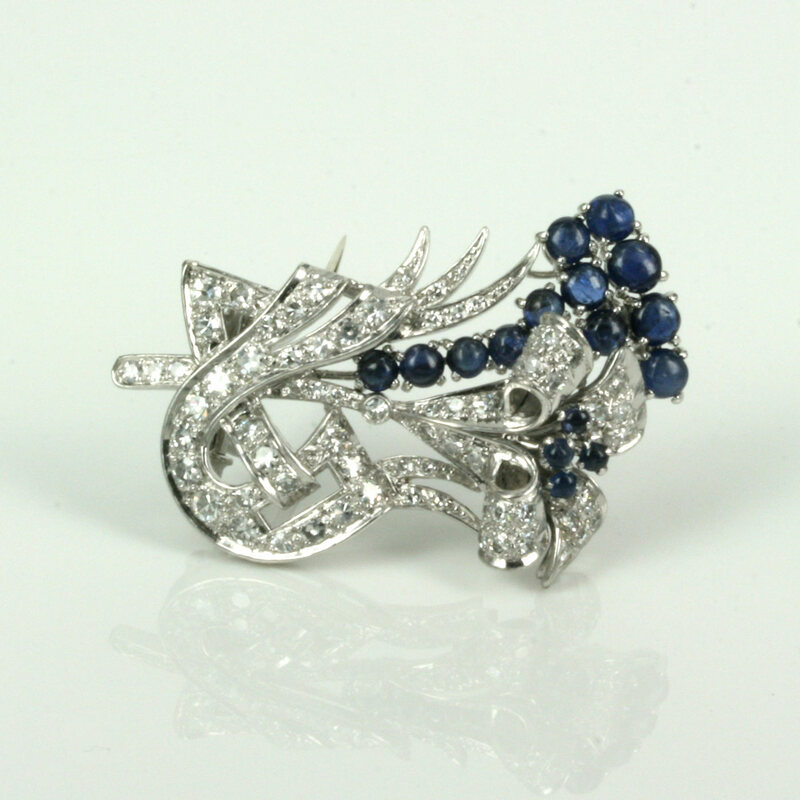 The sapphires are cabochon cut which adds such a unique appeal and character and these sapphires total 2.68 carats. The reverse side shows the quality that was produced by Cartier with the simple yet ingenious design of having two pins to prevent the brooch from rolling over to one side. Worldwide original Cartier jewellery is so highly regarded and sought after, and this Cartier brooch is just spectacular and a true pleasure to own and wear.